Minervois. It reminds of the Deftones' song Minerva. But rather than being a Roman Goddess or a rockin' tune, it's a rockin' AOC in southern France's Languedoc-Roussillon. The cool thing about Languedoc-Roussillon is that it's kinda the wild west south of France. Sure, there's rules and regulations but they're less like what you see from the Old World and more like the New World. Experimentations in viticulture and winemaking are welcome. 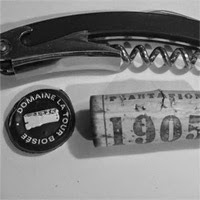 The wines are focused on now and the future and not gated by conservation of the past. Languedoc-Roussillon is a pretty exciting place. Although all sorts of vines are grown and all sorts of wines are produced there, Languedoc-Roussillon does have its traditional grapes. Syrah, Grenache and Mourvedre is a common blend. The subregion of Minervois is particularly fond of Carignan. 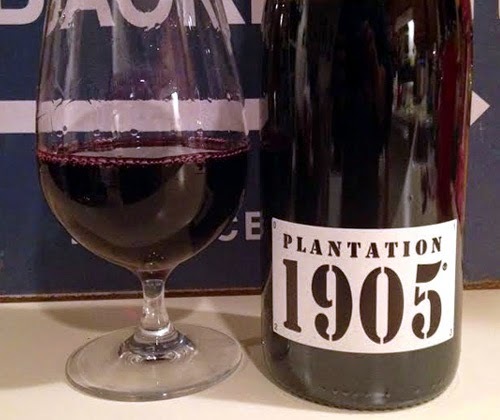 Domaine La Tour Boisee's Plantation 1905 is a blend of 23 different unnamed "traditional grape varieties of the Minervois AOC", all from just one vineyard originally planted in 1905. Twenty-mother-effing-three varieties. Yowza. This is probably the most badass label ever. It's simple but looks like it would stab you without thinking twice. I think my bottle in particular was a member of a biker gang. After it retired from being a pirate. The color of the wine is straight up purple. At first the nose is busy and all over the place. Quinine, strawberry licorice, black olive, black pepper, milk chocolate, almonds, pencil and sweaty socks. It's hard to explain but they're awkwardly separated like they're completely immiscible. Extra swirling and patience dissolves those same aromas together into a harmonious entity that you'd expect from a southern French blend of this nature: good fruit but earthy and a bit danky. The palate is much lighter, brighter and more acidic than I thought it would be. Bright red fruit like strawberries and tart cherries and a finish of acidic cranberry juice. With the exception of some coffee and dustiness, it's a tart fruit bomb. The finish is like cranberries and chocolate covered almonds. Incredibly awesome finish. It's my favorite part of this wine. I have no idea what's in this blend. THERE'S 23 GRAPE VARIETIES SWIMMING AROUND IN THERE! I'm not a wizard! But just for shits and giggles, where would this wine fit in a flavor set? We can assume Carignan, Syrah, Grenache and Mourvedre are involved just from the traditional grapes of the region. So I'll work with those. The nose smells to me like it's mostly Syrah with the black olive, black pepper, milk chocolate and sweaty socks. Mourvedre loves to show up with earthiness so there's the quinine and almonds. 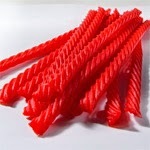 And nobody does strawberry licorice as well as Grenache. Nobody. But the palate tastes like Grenache and Carignan. And I'm even going to add Gamay. It has the strawberry, bright red fruits and light body of Grenache. Caragnan has high acidity and a dusty character. Gamay is infamously described as strawberry jello and has high acidity. Then there's that lovely color. Grenache, indeed. 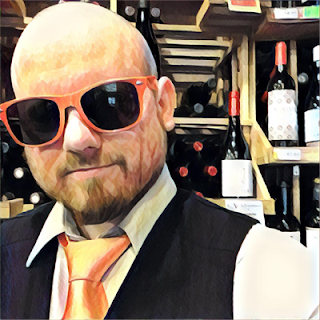 My conclusion: Even if Grenache is a small percentage of the wine, or not even in there at all, it belongs in the Grenache blend / southern Rhone section of style sets. You could even get away with placing it near Gamay / Beaujolais Cru if you wanted or needed to. UPDATE! Drew DiMatteo (@drewdmat on Instagram) hooked me up with the grape varieties: Aspiran, Aubun, Alicante Bouschet, Aramon, Varousset, Calirette, Morrastel Bouschet, Petite Bouschet, Carignan, Cinsault, Grenache, Terret (Black), Terret (Gris), Lladoner Pellut, Bourboulenc, Cardinal, Alphonse Lavallée, Italia, Muscat de Hambourg and four unknown varieties. It's pretty yummy. And quaffable. Very quaffable. Give it a quick chill in warmer weather and you'll be as happy as a fox in a hen house. But in the end: The palate, the same thing that makes it a great spring and summer red, is disappointing when there's so much promise presented. The nose is complex and the finish is dreamy (sigh...) while the palate is a different animal. A party animal. The good news is that it'll cost you $12 and I'd say that's a a good deal. So I give it a final judgment of Satisfying and worth the price of admission. It'll go great with cheeseburgers, macaroni and cheese and barbecue.